It is my great pleasure to thanks all our members and visitors for participation in our Online Sensor Survey 2004: What Do You Use Most ? 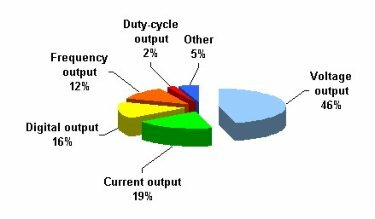 From 2 May 2004 up to the end of 2004 we have received 355 votes and comments with the following results: voltage output sensors - 46 %; current output sensors - 19 %; digital output sensors - 16 %; frequency output sensors 12 %; duty-cycle output sensors 2 % and other - 5 %. The last one includes phase-shift output sensors, charge output sensors and other options. Taking into account the IFSA market forecast 'Forecasts and Modern Sensors Market: Today's Revolution Changes' and 'Sensors and Transducers: Frequency Output Versus Voltage Output' the market share for frequency-time domain sensors and digital sensors on its basis will be increased in the next five years. Today there are a lot of manufactures producing digital output sensors with different interfaces and buses capabilities. It is still difficult to find the one to suit the smart sensors' requirements. As usually, sensor interfaces and buses are strongly associated with their field of application. Smart sensors are a new kind of application. So, our next Survey 2005 is about modern sensors interfaces and buses. As usually, our online mini survey will work like a mini forum. You are very welcome to answer only one survey questions ' What do you use most in your sensors and sensor systems ?' and give your comments and suggestions at http://www.sensorsportal.com/HTML/Polls.htm. Click the ' view results' and than 'comments' to see current results and opinions. In order to use it you must have Internet Explore 5.0 or Netscape 6.0 or higher browse version. In addition we will also publish this Survey in ASCII text format and online in IFSA Newsletter. Happy ping and nice Net surfing in 2005 ! The book 'Smart Sensors and MEMS' provides an unique collection of contributions on latest achievements in sensors area and technologies that have made by eleven internationally recognized leading experts from Czech Republic, Germany, Italy, Israel, Portugal, Switzerland, Ukraine and USA during the NATO Advanced Study Institute (ASI) in Povoa de Varzim, Portugal, from 8 to 19 September 2003. The aims of this volume are to disseminate wider and in-depth theoretical and practical knowledge about smart sensors and its applications, to create a clear consciousness about the effectiveness of MEMS technologies, advanced signal processing and conversion methods, to stimulate the theoretical and applied research in these areas, and promote the practical using of these techniques in the industry. With that in mind, a broad range of physical, chemical and biosensors design principles, technologies and applications were included in the book. It is a first attempt to describe in the same book different physical, chemical, biological sensors and MEMS technologies suitable for smart sensors creation. The book presents the state-of-the-art and gives an excellent opportunity to provide a systematic, in-depth treatment of the new and rapidly developing field of smart sensors and MEMS. The volume is an excellent guide for practicing engineers, researchers and students interested in this crucial aspect of actual smart sensor design. Piscataway, NJ. Recently created by IEEE a web site contains a registry to support plug-and-play use of analog transducers in networks containing digital sensors and actuators. The registry, an extension of the organization’s new IEEE 1451.4 standard, offers three sets of registrations: unique identifiers manufacturers assign to specific devices; manufacturer identification numbers; and templates linked to the units associated with a transducer. There are IEEE Standard 1451.4 Registration section; Introduction and History; Distinguishing features of IEEE Std 1451.4; Form for IEEE 1451.4-2004 manufacturer ID; Form for submitting a template or TDL item and IEEE Standard 1451.4-2004 Tutorials at the new web site. 1) Every month you can send your sales message to 44,500 subscribers of the IFSA newsletter. Would you like to reach this very targeted buying audience? For just 15 $ per thousand subscribers you can tell 44,500 decision making persons about your products and services in sensors, MEMS, measuring instruments and DAQ systems area. Please send us a product title, short description and URL or/and e-mail address for contact. We have the most targeted sensors online and electronic advertising opportunities available in the Net !